Armenian Shakespeare Association (ASA) is pleased to inform about the Second ASA International Conference in Yerevan from September 27 to October 1, 2018. 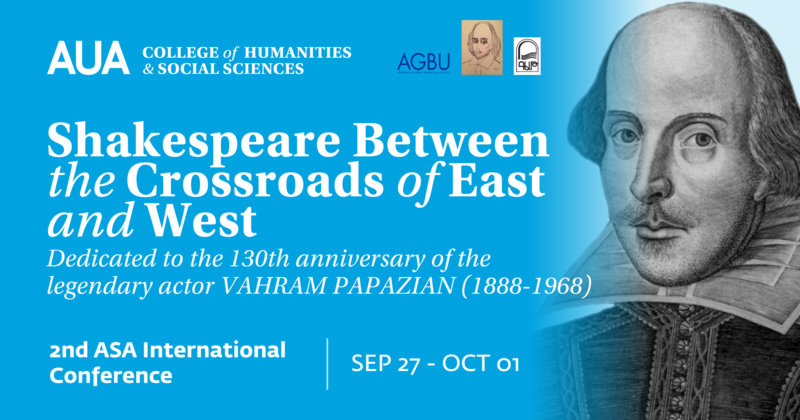 The Conference is titled “Shakespeare Between the Crossroads of East and West” and is dedicated to the 130th anniversary of the legendary actor Vahram Papazian (1888-1968). Thursday 09/27/2018, 12:00pm – 2.00pm: the opening of the conference and projection of the film “Capital Older than Rome” at the American University of Armenia Akian Gallery, PAB building, 4 th floor (40 Bagramyan avenue). Friday 09/28/2018, 10.00am – 1.30pm։ keynote speakers (Prof. Jerzy Limon – Poland, Prof. Lisa Hopkins – GB, Prof. John Maune – Japan) at the AUA Small Auditorium, Main Building, 5th floor. Saturday 09/29/2018, 10.00am – 1.30pm: presentations including the keynote speaker Member of the Armenian Academy, Prof. Henrik Hovhannisyan on Vahram Papazian at the State Museum of Arts and Literature (1 Aram street). Sunday 09/30/2018, 7.00pm: performance of Romeo and Juliet followed by discussion with the cast and the director led by Pr. Jerzy Limon at the State Chamber Theatre, (58 Mashtots avenue), free for conference guests and students. Monday 10/01/2018, 10.00am – 1.30pm: keynote speakers (Prof. Sheila Cavanagh – USA; Prof. Manfred Draudt – Austria, Jasmine Seymour – UK) at the AUA Small Auditorium, Main Building, 5th floor.